The city of Moscow is a capital of Russia, located in the west central European part of the country. It was also the capital of the former Soviet Union from 1922 to 1991. 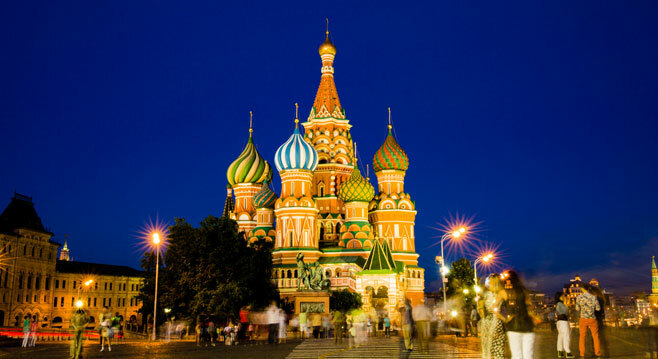 Tourism in Moscow and points of interest : The Red Square, Historically a venue for military and civilian parades, Red Square is bordered by several Russian monuments and attracts tourists to its downtown Moscow location. A red stone wall on one side of the square surrounds the Kremlin, which served as the center of government for the entire Union of Soviet Socialist Republics (USSR) before the dissolution of the USSR in 1991. Saint Basil’s Cathedral, left, with its multicolored onion-shaped domes, boasts some of the most distinctive architecture in the world. Red Square measures 0.4 km (0.25 mi) in length. In Russia : The terrace of the Great Palace at Petrodvorets overlooks magnificent waterfalls, gilded fountains, and a statue of Samson prying open the jaws of a lion. The statue commemorates Peter the Great’s victory over the Swedes in 1709 on Saint Samson’s Day. A summer residence for Peter the Great, the Great Palace was designed by a French architect in a style reminiscent of the palace at Versailles, and it was completed in 1721. During World War II, Germans destroyed most of the building and stole many treasures, but the Great Palace has since been painstakingly restored.